You have found spelling or error grammars, or you think you can complete the page with relevant information, you thing you can enhance the quality of the content. Simply click on the "Edit" link. a checkbox named "major change"
The title is the title of the page. This is the public title of the page. That is, the title which will be used to create the page's url. The alternate title may be empty. This is the "display" title of the page. If defined, this is the title which will appear in the location area, the sub content area, the recent changes and in the syndication feeds. If it is not defined it will default to title. What's the purpose of having two titles for a page ? For example you can have several people wanting to have a "diary" page. As title must be unique (because 1 title = 1 url = 1 page), once a page named diary exist, another can't be created. So if say, "John" already created its "diary" page, "Bob" won't be able to create its own. Instead, Bob can create a page named "Bob_diary" and add an alternate title named "diary". See it as a display feature : it helps your page be displayed better whatever is the url used. If you use the wikiblog plugin, it can be of interest : In the blog world, titles in urls are often prefixed by the date. Something like http://myblog.com/2006-02-05-my-blog-entry. And of course you don't want to see 2006-02-05-my-blog-entry be displayed : You can add an alternate title named "My blog entry" which is more pretty. Isn't it ? The parent section indicates the "parent" page of the page you're editing. See also moving a page. Do you remember the location area and the sub nodes area seen in the browsing page ? The following textarea (the content textarea) is the more important control. This is here you will see the content of the page. This is here you will be able to edit the content of the page. As you will see, the content is written mostly in plain text but from times to times you will see it uses some weird syntax. 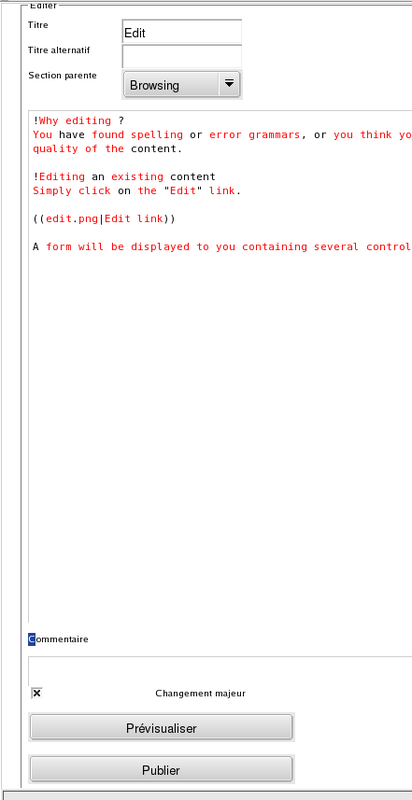 This syntax is described right below the form in the "quick edit help" section. You will see how to write a title, lists, how to insert images, tables and galleries. You also have a checkbox saying if the changes was a major change or a minor one. The purpose is to help others understand what kind of changes you just did. If it's a typo or a syntax changes, then this should be a minor change and you'd better uncheck the checkbox. If you added 2 more pages of explanation then this is a major change. Those two last controls are displayed in the history page. Once you're done with the change you can either publish it, or preview it. Previewing is like re-reading a letter or an email before sending it : the more you preview, the less you will leave stupid mistakes like mispelling, typos, or bad presentation. And then, when you're happy with the result, you can publish it. When you follow a link, you may find an empty page. In that case, you will have a page with a "no content" warning message. You can edit it, the only thing that will be prefilled will be the title. You can assign a parent and enter its first content. As you will see, langs are a very important Wiclear's feature. As a result, you will see the site is parametrized with a default lang. This is the lang of the anonymous user and this is the lang of all new pages. 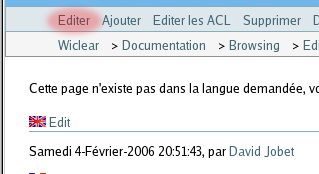 For example, the default lang of this site is set to english : I won't be able to start editing a fresh new page in french. I will have first to edit the page in english, then once it has been created (even if its sole content is "TODO") I will be able to translate it to french. This is done on purpose. The goal is to have all pages be written once in one default lang : The original lang (or the master lang). Then all other pages are translations of those master pages. The better way to understand all of this is to have a try. There is a special page done for this purpose. This is the Sand box page. Follow this link and start editing it.